Boating is an activity that truly offers something for everyone, whether the crew is fishing, skiing or just messing around. It requires preparation and planning to ensure each outing goes smoothly. Our 11 commonsense tips will make your time on the water safer and more enjoyable. Check the weather before heading out. Always check weather forecasts and warnings before you leave the dock, and remain vigilant on the water. Listen to NOAA weather radio broadcasts on a VHF radio, for weather warnings and forecasts on the water. Before the outing, view forecasts online at nws.noaa.gov/nwr or on any of the other various weather websites available, such as Weather Underground (wunderground.com) and Weather Bug (weatherbug.com). It’s also a good idea to have a bailout plan in the event of severe weather. Check area charts for possible safe harbors nearby, in case you’re unable to make it back to your departure point. File a float plan. From a safety standpoint, letting a responsible person on shore know where you’ll be boating and when you plan to return is a no-brainer. A float plan not only ensures that search and rescue agencies are notified in a timely manner in the event of an emergency, but it also speeds up response times by narrowing down the search area. Free float plan forms are available for download at Float Plan Central (floatplancentral.cgaux.org/). When filing a float plan, make sure the information provided is both detailed and accurate. Avoid last-minute on-the-water changes such as boating destinations and the launch ramp used, unless you can contact and update the person who’s maintaining your float plan ashore. Install smoke and carbon monoxide detectors. Marine-grade smoke and carbon monoxide (CO) detectors are recommended on all boats over 26 feet in length that have a galley and enclosed sleeping quarters. All internal combustion engines and open-flame equipment — stoves and heaters, for example — emit CO, an odorless, colorless gas that can kill in minutes. CO may also be drawn into the cabin from other vessels through ventilation systems. An even better option for boats that utilize a generator to power air conditioners and other appliances would be a CO alarm system designed to shut off the generator once CO is detected. Practice dockside and underway safety drills. Nothing can better prepare an owner and his crew for an emergency than regular safety drills. Draft basic instructions for events such as fire, a man overboard (MOB), sinking and any situation that seems possible, and discuss safety equipment location and procedures with everyone on board. Assign roles and responsibilities to crewmembers where appropriate, and make sure all crewmembers know what’s expected of them in an emergency. Mix it up a bit to make drills more interesting and to better prepare for those “out of the box” situations — the captain as the MOB, for example. Don’t forget to include younger crewmembers. Teaching your 10-year old how to operate the VHF radio and make a distress call instills confidence and just may save a life — maybe yours. Buy life jackets people will actually wear. 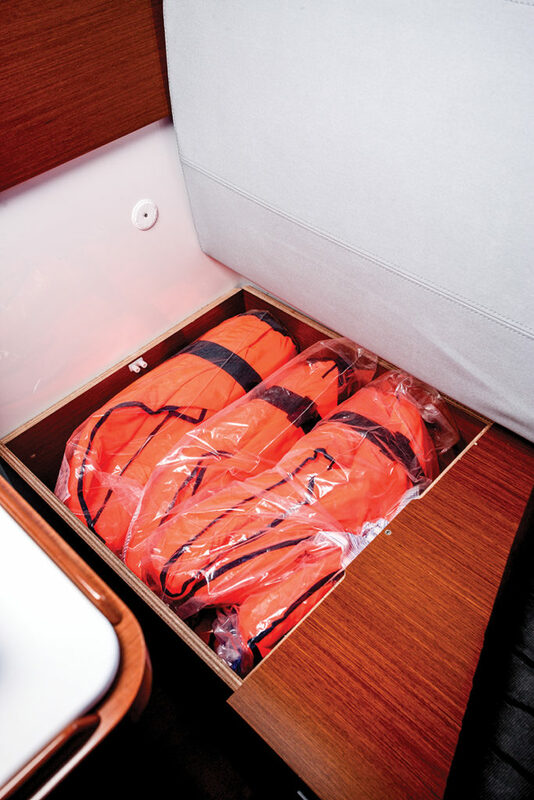 Most boats carry the obligatory four-for-$25 orange rectangular life jackets, so they meet the minimal requirements of one per every person aboard. They remain stuck in some out-of-the-way locker and rarely see the light of day. 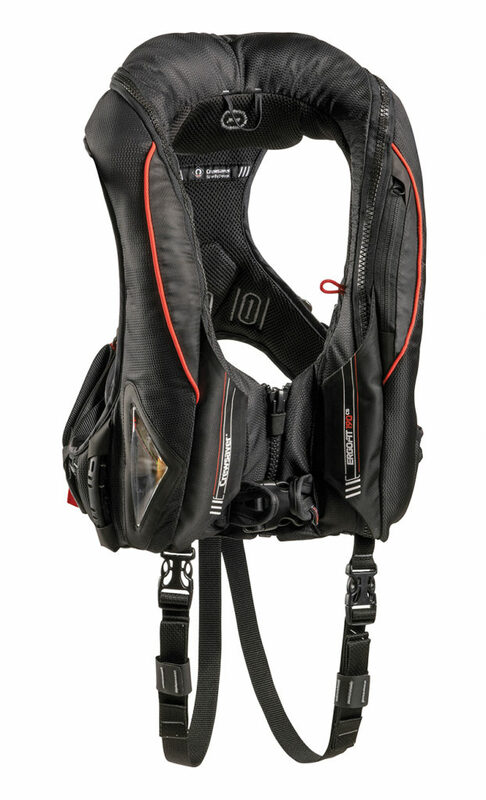 Why not take your safety game up a notch by upgrading to life jackets the crew will actually wear? Newer life jacket designs, such as inflatable vests or “fanny pack” types, are comfortable and affordable. Wearing a life jacket should be second nature to boaters, akin to automatically donning a seat belt when getting in a car. Go beyond the minimal safety requirements. 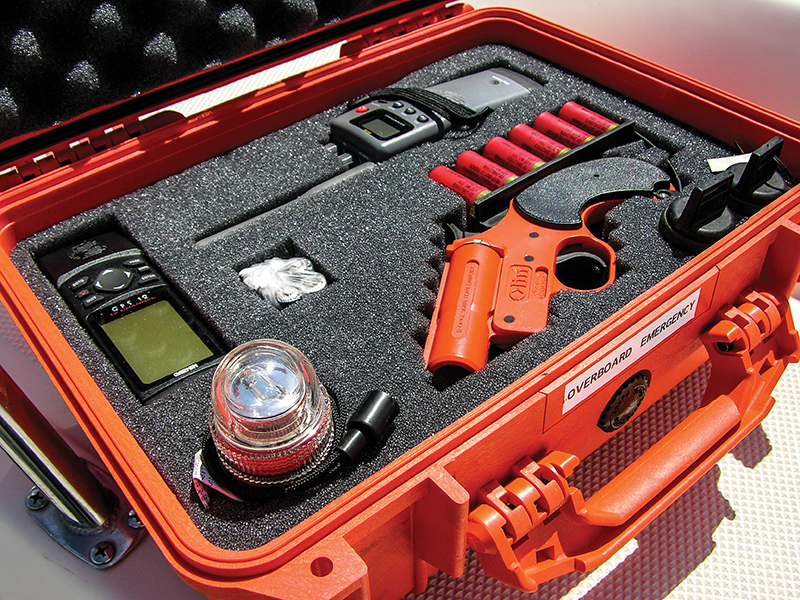 The U.S. Coast Guard requirements for items such as flares and portable fire extinguishers are the bare minimum. Most boaters don’t realize the average discharge time for the B/C Type I dry chemical extinguishers on most boats is only eight to 15 seconds or that the typical burn time of a red day/night handheld flare is 40 seconds or less. These minimum requirements should be viewed more as a starting point than the final word. Conduct a safety brief before each trip. A pre-departure safety brief is always a good idea, especially with new folks aboard. Cover the basics, such as the location of safety equipment (e.g., fire extinguishers, life jackets, first aid kit), but don’t be afraid to include additional topics, such as use of the VHF radio. Post a diagram of the vessel that shows were everything is, from seacocks to fire extinguishers. Learn how to swim. Wearing a life jacket is well and good, but what better way to increase one’s boating pleasure and confidence on the water than knowing how to swim, should the need arise. Sign the kids up, too. Conduct an annual safety inspection. 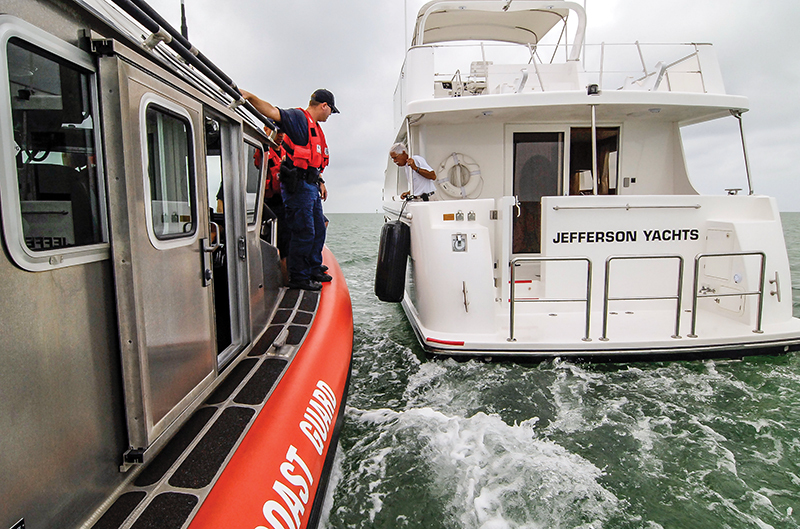 The U.S. Coast Guard Auxiliary offers free Vessel Safety Checks. Auxiliary members check your boat’s equipment and provide information about its use, safety procedures and applicable regulations. Unlike a real boarding by the Coast Guard, you don’t have to worry about getting a citation during this inspection. They simply let you know how to correct any deficiencies or problems they find. Install a high-water bilge alarm. When it comes to dealing with flooding, quick detection is the key. The early warning provided by a bilge alarm can add valuable minutes — extra time to find the leak (while it’s still above incoming water), don life jackets, bring additional pumps online or send out a last-ditch distress signal. Make sure the alarm is loud enough to be heard over engine noise and by marina personnel or passersby when the boat is docked. Buy a PLB or EPIRB. With PLB units available for less than $200, even the most tight-fisted boat owner can afford to add a PLB to the arsenal of onboard safety equipment. Always register all PLB or EPIRB units with NOAA (beaconregistration.noaa.gov/), and don’t forget to update any changes (e.g., contact phone numbers, units that are sold). For an extended cruise, use the “Additional Data Field” to provide information such as number of passengers, special considerations (medical issues) and anything else that’s suggested. ← Previous Previous post: Planning to go Offshore?